Dortmund - Der Klassiker lived up to its billing on Saturday evening as FC Bayern München maintained their four-point lead at the top of the Bundesliga courtesy of an enthralling 3-0 win over title rivals Borussia Dortmund. After a hard-fought first-half saw the sides go in level at the break, it was the league leaders who broke the deadlock in Saturday's showdown as Mario Götze scored with only his sixth touch of the ball. Arjen Robben and Thomas Müller completed the scoring, ensuring the record titleholders preserved their record-breaking unbeaten streak to move seven points clear of third-placed BVB. With the just over 80,000 capacity crowd creating an atmosphere worthy of the occasion, both teams set themselves up as expected in the hotly-contested opening exchanges. Dortmund, content to sit deep and press with their new-look backline, were patiently waiting on their opportunities to break forward at pace and almost opened the scoring inside five minutes when one such counter saw Robert Lewandowski slice over on the volley from Jakub Blaszczykowski’s inswinging cross. The visitors, meanwhile, were attempting to render BVB’s pressing game futile by establishing a control on possession. For all the time they spent on the ball, however, Bayern were struggling to carve out their chances in the final third in the same manner as their hosts, who continued to look the more likely to score. As the encounter became increasingly expansive approaching the half-hour mark, Blaszczykowski twice had shots from inside the box blocked by opposing defenders, before Marco Reus failed to take advantage of a slip by Jerome Boateng, opting for power over precision and firing straight at Manuel Neuer in a one-on-one situation. Though time and space were at a premium, Bayern began moving the ball with greater aplomb with half-time approaching. Mario Mandzukic’s acrobatic attempt drew the first real save out of Roman Weidenfeller, who was called into action again seconds later to prevent Thomas Müller curling an effort into the far corner, ensuring that the sides went in level at the end of an emotionally-charged first half. The intensity of proceedings showed no signs of diminishing after the break with Lewandowski, as he did in the first-half, going close to breaking the deadlock early, coming within a whisker of heading Sven Bender’s delicate cross beyond Neuer. For the most part though, both teams were cancelling each other out, with the contest producing little in terms of goalscoring chances from open play. 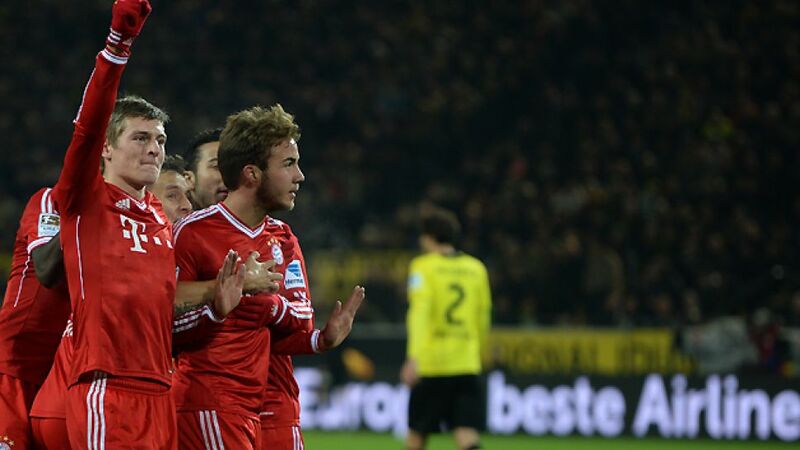 However, it was the introduction of the returning Götze that breathed new life into an already feisty encounter, as the 21-year-old took just ten minutes to make the desired impact, floating into a pocket of space on the edge of the BVB box to collect Müller’s drilled cross and taking one touch before toe-poking the ball into the bottom corner. Dortmund threw caution to the wind in response to falling behind and twice wasted gilt-edged chances to pull themselves level. Henrikh Mkhitaryan blasted over the bar from ten yards after getting himself caught in two minds, while Reus had Neuer at full stretch to tip his drilled effort around the post. However, Bayern soon exploited the space afforded to them by their hosts, grabbing a quickfire double in the final ten minutes as Thiago found Robben in acres of space, allowing the Dutchman to bear down on goal and chip the ball beyond a stranded Weidenfeller. Müller then completed the convincing win three minutes from time, stroking home from Phillip Lahm’s cut back to stretch Bayern’s unbeaten run to 38 games.